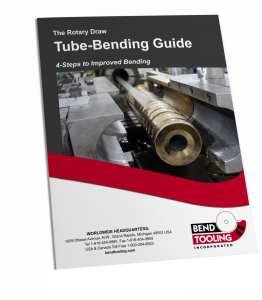 Wall thinning, as opposed to wall thickening, is an issue tube-benders take particular notice of, because many bend applications require a minimum wall thickness in the finished product. Many factors play a role in determining how much a wall will thin, not the least of which is the set-up. One of the key objectives of a good set-up is to minimize drag at the point of bend, which in turn minimizes the amount of wall thinning. To determine a realistic target for wall thickness of the extrados after thinning, use the following formula: WT – (( OSR – CLR ) / OSR x WT ) = RWT where “WT” is the starting wall thickness, “OSR” is the outside radius, “CLR” is the centerline radius, and “RWT” is the thickness of the wall after being reduced by bending. For example, in a 2″ TOD x .065″ WT x 4″ CLR tube bend, the calculation for the target post-bend wall thickness is .065 – (( 5 – 4 ) / 4 x .065) = .04875. Therefore, a realistic target for wall thickness in this application is about .049″. Achieving this target value assumes a “forward-mandrel, low-pressure” set up that reduces the drag of direct pressure at the point of bend and maximizes the effect of assist pressure. Increasing the assist pressure will account for variations in material plasticity, but will not significantly exceed the target value. To substantially increase this value will normally require starting with a heavier wall. However, boost pressure, which is a special feature most machines lack, is a mechanical means of measurably exceeding the target value, although at the expense of excessive thickening of the wall of the intrados. (See the articles under assist pressure and boost pressure for additional details.